Here at Antelope Valley Nissan, the Pathfinder is one of our more popular vehicles, and it is very easy to see why. Standard roof rails with optional crossbars allow you to haul everything you need for a day at the beach. 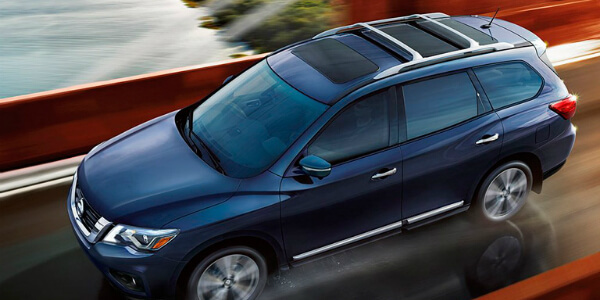 You can even take the crossbars off to enjoy the available dual panoramic moonroof that provides a spectacular view no matter which seat you’re in. Bringing the entire family along for trips around the state has never been easier than with the 2017 Pathfinder. Able to seat seven people comfortably, there’s room for everyone and their stuff in the incredibly spacious interior. Equipped with the latest technologies like screens built into the back of the front seats, the 2017 Pathfinder has the ability to keep the entire family connected to their favorite apps and more. 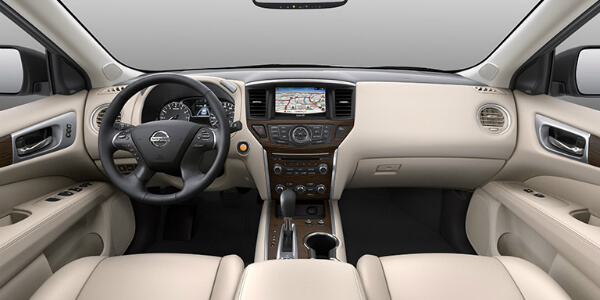 The Pathfinder is also able to utilize an Intelligent Cruise Control feature that will keep you at a predetermined distance from the vehicle in front of you. When they slow down, so will your Pathfinder. If they speed up, your Pathfinder will too! Hands-free access to the back of the Pathfinder allows you to simply swipe your foot under the rear bumper, and the liftgate will automatically open so you won’t need to worry about placing anything on the ground. The 2017 Nissan Pathfinder is able to utilize many different features to help keep you and your family safer on and off the roads. The Intelligent Forward Emergency Braking system is able to give you both visual and audible warnings if it senses the possibility of a collision. It can even apply the brakes for you if you are unable to react in time. The Blind Spot Warning feature uses sensors along the sides of the Pathfinder to determine whether or not another vehicle is in a place where you cannot see them. If the vehicle is still there as you turn on your turn signal to switch lanes, it will send you alerts telling you to wait until the coast is clear. While we could go on and on about the many more features of the 2017 Nissan Pathfinder, we know that you’re itching to check it out for yourself! If you would like to schedule a test drive, you can now do so right from our website to make sure that you get the time and date that fits your schedule the best. If you have any questions about the Pathfinder, or any of our other incredible Nissan lineup, we encourage you to stop by or give us a call and our friendly and knowledgeable team will be more than happy to give you all the answers you need to get into a brand-new 2017 Pathfinder!